Crosby, Stills and Nash's 1969 Marrakesh Express famously sung the praises of "Colored cottons hang in air, Charming cobras in the square, Striped Djellebas we can wear at home" and half a century later that image of Marrakesh as a city agreeably stuck in a touristic time warp remains. Which could not be further from the truth. Yesterday I attended the Marrakesh ePrix at which the accompanying photos were taken. This is an international race for cars that superficially resemble their more familiar Formula One counterparts but which differ radically under the bodywork, because they are 100% electric powered. Formula E, which races in many major cities including Hong Kong, New York and Berlin, is a laudable attempt by motor sport to clean up its environmental credentials. The standard objection that electric cars require fossil fuel to generate their electricity is overcome by using specially commissioned generators that run on glycerine, which is a byproduct of bio-diesel, to recharge the cars. The generators are transported with the cars and associated kit from race to race using transport that minimises the resulting carbon footprint. Other environmentally aware policies include limiting the number of team personnel at races and eliminating the lavish hospitality facilities that are a feature of Formula One. To cap costs and limit competitive advantage many parts are common to all cars, including the chassis (monocoque), bodywork and battery pack. 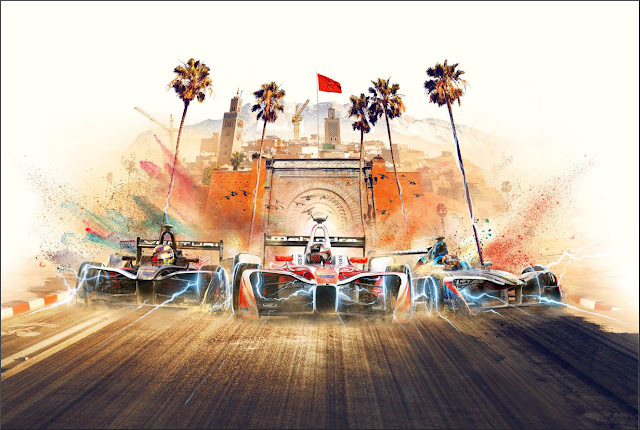 View video of Marrakesh ePrix highlights via this link. The Noor Ouarzazate Solar Complex in the Moroccan Sahara came on stream in 2016 and when completed will be the world's largest concentrated solar plant with the potential to power one million homes. Marrakesh has a fleet of Chinese manufactured electric buses. Renault and Peugeot both plan to build electric vehicles in Morocco, as does Chinese corporation BYD which has a 13% share of the global electric vehicle market. One of the teams competing in the Marrakesh ePrix was NIO backed by the eponymous Chinese electric, autonomous vehicle manufacturer, while the winning car came from the team of Indian auto and technology company Mahindra - see photo below. As can be seen in some of my photos, 52% of the Moroccan population is under 25 and they are rearing to go places. Preconceptions about charming cobras in the square and about the perils of majority-Muslim nations need to be ditched before the West is caught napping. And it is not just the President of the United States who is guilty of damaging preconceptions about countries beyond Western comfort zones. While taking these photos a Moroccan boy of about ten tapped me on the shoulder and proffered a bottle of water. I waved him away brusquely, thinking he was an urchin trying to make a few dirhams by selling refilled bottles. But he persisted and finally explained by sign language that the bottle had fallen out of my daypack a few minutes earlier. Travel to and accommodation in Marrakesh was self-funded. Access passes to the track and pits were provided by a Formula E technology supplier. Photos are (c) On An Overgrown Path 2018. Also on Facebook and Twitter. You are a lot more optimistic about Morocco than I am. I have spent the last two months cycling across Morocco to the Mauritanian border (and further). My overall impression is that Morocco has stagnated, virtually unchanged in the ways that matter from my first visit there a decade ago. The majority of the population remains functionally illiterate, if not completely illiterate. The ruling class clearly only cares about coastal areas, Fes, and Marrakesh, and is content to ignore the rest of the country. While a lot of schools and other such infrastructure have been built in the last few years, the locals explained that they are essentially Potemkin villages, showpieces that were never actually staffed (and are often already falling into disrepair). The beginning of my trip coincided with the demonstrations in the Rif pointing all this out. People seem more religiously fundamentalist than they used to be, and the niqab and Salafi men's dress can now be seen in once-secular places like downtown Agadir. "The majority of the population remains functionally illiterate, if not completely illiterate." The niqab and Salafi men's dress seen in Agadir were almost certainly not worn by Moroccans. They are worn by the many tourists from the Gulf states that have come to Morocco in recent years because of the strong links between the two regions. So sorry Chris, that is one very negative strike against you; so you are out of this discussion. "And it is not just the President of the United States who is guilty of damaging preconceptions about countries beyond Western comfort zones." That story about the water bottle is great! So good of you to tell it on yourself. I also very much appreciated the vignette about the water bottle and the question of clearing our minds of tired stereotype. As for the comment by Chris, I would say, as someone who has lived here a long time, that there are certainly pockets of the country where Morocco's progress (if you define that in terms of more and better medical help, education, and employment) is still not very visible, but we've seen enormous change including in the countryside where we have a house. When we bought the place, there was no electricity, no telephone, and it was rare to see a girl being sent to school. That's all changed. And as far as "salafi" influence, yes, it's there, but I wouldn't base too much on seeing a niqab-wearing woman in Agadir. There's nothing against the law about a woman wearing what she wants (unlike in some places in France).